Well, the annual symposium of the Quebec Centre for Biodiversity Science (QCBS) was quite some time ago now. But I greatly enjoyed the opening talk by Michael Donoghue of Yale University, and so now that QCBS has posted the slides to Dr. Donoghue's talk, I thought I'd do a quick post riffing on one aspect of it. All the interesting ideas here belong to Dr. Donoghue; my intention here is basically to call attention to some of his ideas by reiterating them here. If my contribution here reminds you of Ms. Anne Elk, I (ahem) beg your pardon. The bit of Dr. Donoghue's talk that I want to discuss here had to do with leaf margins: the edges of leaves. Leaf margins can be described as being "toothed," with serrations, or "entire," with smooth margins. This is perhaps something that you have never thought much about, although you've doubtless seen a good many leaves in your life; but it turns out that, contra Fermat, there may be a truly remarkable proof of evolution and adaptation contained in their margins. Dr. Donoghue presented some work from his own lab involving Vibernum, a genus of ~170 species of woody plants with a wide distribution in the Americas, Eurasia, and parts of Africa and Oceania. Most viburnums are temperate, but the tropical species are sprinkled across the phylogeny, rather than representing one or a few monophyletic clades. This had been interpreted as showing multiple independent origins of adaptation to tropical conditions from a temperate-adapted ancestor. Clement et al. (2011) constructed a new and improved phylogeny that shows that the opposite may be true: the genus may be ancestrally tropical, and then have diversified into temperate zones. And herein lies the puzzle. In further work based on the new phylogeny of Clement et al. (2011), Schmerler et al. (in prep) cast into sharp relief an interesting pattern: the correspondence between the climate in which a particular Viburnum species lives, and the type of leaf margins it has (Fig. 1). 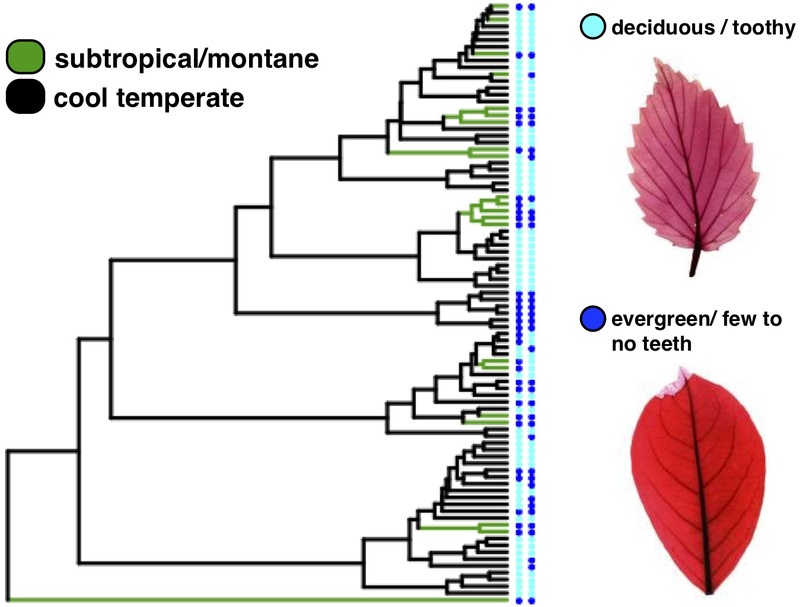 Despite what appears to be a complex evolutionary history with many independent transitions between tropical and temperate regions, the association between climate and leaf margin is strong across the whole phylogeny. Figure 1. Association between climate and leaf traits in Viburnum. Taken from Dr. Donoghue's slides, based upon Schmerler et al. (in prep). This mystery is larger than Viburnum; that genus is just one striking example of the pattern. Indeed, Peppe et al. 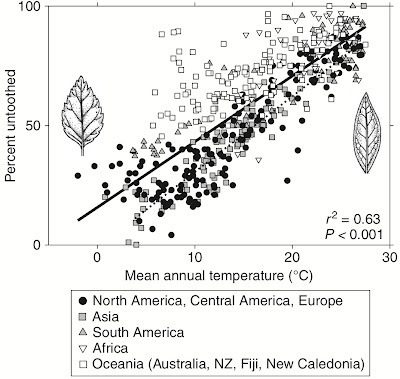 (2011) show that plants in colder climates generally tend to have toothed leaf margins, while those in warmer climates tend to have entire leaf margins (Fig. 2). This pattern holds worldwide, and the correlation is quite strong. Several reasons for this correlation have been advanced, having to do with carbon uptake, sap flow, water availability, root pressure, and so forth; there are lots of cites to such explanations in Peppe et al. (2011). Figure 2. 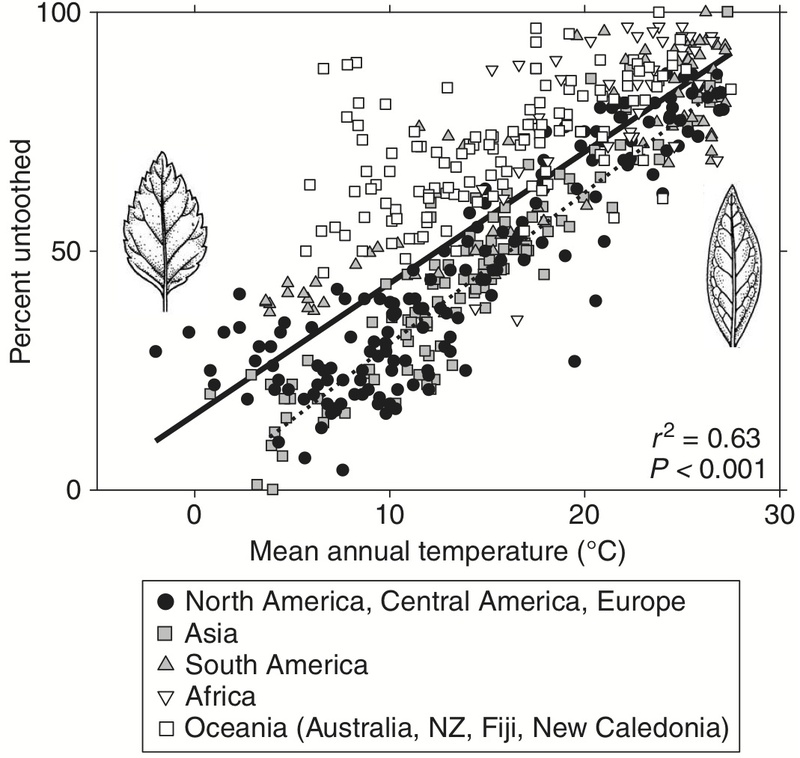 Leaf margin toothedness as a function of mean annual temperature. Taken from Peppe et al. (2011), their Figure 5; modifications by M. Donoghue. If I recall correctly, however, Dr. Donoghue said that none of these explanations really seemed terribly convincing. And yet the pattern remained, in need of an explanation. This is where things get really cool. Couturier et al. (2011) propose that there is a "filling law" that governs the shapes of leaves that grow from buds; in order to pack the developing leaf into the bud as tightly as possible, leaves must have particular shapes, and specifically, their margins must be toothed in particular ways. (Tight packing in the bud may reduce the possibility of frost damage, and the shape and size of the bud may also have effects upon herbivory, if I read them correctly.) They work this hypothesis out in remarkable detail; their paper is a tour de force that essentially founds the new field of biological origami (Fig. 3). Figure 3. 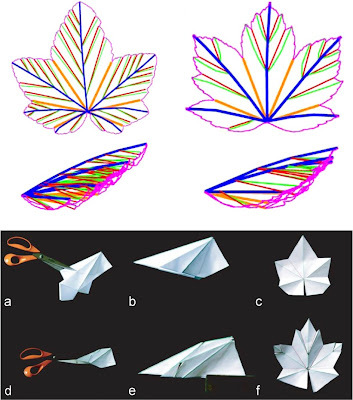 Biological origami: how leaves fold into compact buds. Taken from Couturier et al. (2011), their Figures 6 and 7. Their rather fascinating hypothesis, then, is that leaf toothing may have nothing to do with any adaptive value associated with the fully developed leaf; rather, the adaptive value may come from the way that a particular leaf shape folds compactly into a bud. The dynamics of bud growth may determine mature leaf shape, rather than the other way around. And leaves in the tropics may tend to have entire margins because they are evergreen, not deciduous, and do not grow from buds as deciduous leaves do. The colder the climate, the more important it is that leaves are deciduous and begin as tight buds, and thus the more likely it is that the mature leaves will be toothed. So that's the story. Now, if you will indulge me, I'll give just a few musings of my own. The reason I like this tale is that it reflects in interesting ways on the idea of the "just so story." Rudyard Kipling wrote his Just So Stories 110 years ago, and they have become a symbol of one of the dangers of evolutionary biology: the "adaptationist" paradigm of assuming that everything must have a reason for its existence — and the subsequent invention, from whole cloth, of said reason. As Stephen Jay Gould and Richard Lewontin (1979) argued so eloquently, traits are not necessarily adaptive. Some things just are, by accident; other things are because they could not be otherwise; and still other things are because their evolution was constrained in some manner — they are because something else is. In this context, the old explanations for leaf margins might be "just so stories": they might be hand-waving, ad hoc explanations for a phenomenon that was actually, in Gould and Lewontin's terminology, a spandrel. A spandrel is a trait that exists as a result of selection on something else; it is not selected for itself, it is simply carried along. At a genetic level, spandrels might be due to pleiotropy, for example: a gene might have unimportant (non-adaptive) effects on leaf margin, but important (adaptive) effects on some other trait related to climate adaptation, and so adaptation to a temperate climate could produce a correlated change in leaf margins. Such correlations could also be produced by genetic linkage. For this reason, it's dangerous to fall too far into the "adaptationist" or "Panglossian" paradigm of assuming that we inhabit the best of all possible worlds – that every trait is a perfect adaptation to the environment. The old explanations for leaf margins now appear, in hindsight, to fall into this category (at least to some extent; they may also have some truth to them, and I don't mean to prejudge that). And yet, and yet. What Couturier et al. (2011) have shown us is that even the most obscure, innocuous trait — the serrations at the edges of leaves — may have an adaptationist explanation after all. It isn't the explanation that occurred to biologists at first blush, and so the dangers of the just so story remain very real. But the explanation is there. I don't mean to imply that this is invariably true; I certainly believe that pleiotropy, genetic constraint, sexual selection, and so forth do cause maladaptation in traits, and probably even more commonly cause non-adaptive (neutral) divergence in traits. But the adaptationist program is alive and kicking. Very often, there are reasons for things to be the way they are, and it's worth the effort to look for those reasons. And those reasons, once you finally discover them, are often stunningly beautiful and wholly convincing. Thus it is with leaf margins and the filling law. As Stephen Colbert might observe, toothiness and truthiness are not so far apart. 2. Schmerler, S., Clement, W., Beaulieu, J., Chatelet, D., Sack, L., Donoghue, M.J. and Edwards, E. (in prep). 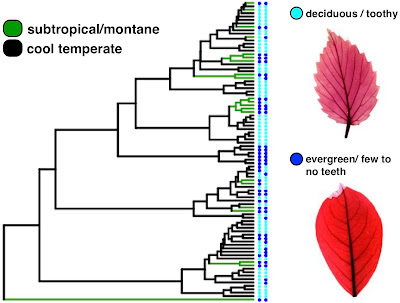 Evolution of leaf form correlates with tropical-temperate transitions in Viburnum (Adoxaceae).